A member of a Wiltshire-based group who build replica Daleks thinks the recent design makeover of the Dr Who villains makes them look like Teletubbies. Ady Davies, 52, from Rudloe also believes this is the real reason why they have been removed from the show. Doctor Who producer, Steven Moffat, recently said the Daleks will be "rested" because the Doctor has defeated them "about 400 times". But Mr Davies believes the decision is because the new look proved unpopular. 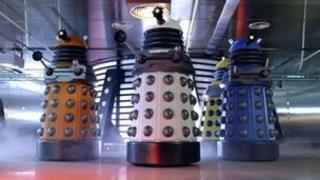 He said: "I don't think it's a case that people are fed up of Dalek storylines. I think that people just have a complete dislike for the new design of Dalek. "These new ones look like Teletubbies. They look like gone-wrong Lego plastic kits. I don't know anyone who likes them. "And rather than admit that they've messed up, they're just trying to sweep them under the carpet and give them a rest so people forget what they look like." Replica Daleks of a more classic design variety can be seen at various sci-fi and cult events around the country where Mr Davies and other members of the Charity Sci-Fi group show off their creations. Mr Davies had no DIY skills when he started building Daleks three years ago, but the four models he has since built, and shows off at events, look as authentic as the original props. The Charity Sci-Fi group raise money for a variety of charities at each event, and in 2010 they raised a total of £6,181. Their next booking is on Saturday at North Swindon Library and is in aid of cancer charities Macmillan and Marie Curie. The event will be in memory of Doctor Who actress Elisabeth Sladen who played much-loved companion Sarah-Jane Smith. Ms Sladen died of cancer aged 62 in April. Mr Davies said: "We felt that it would be good to do something as a tribute to Lis for the amount of time she spent on Doctor Who and The Sarah-Jane Adventures. She was just such a phenomenal person. "In making the event a tribute to her, we hope we can raise as much money as we can." At each Charity Sci-Fi event, children and adults have the opportunity to get up close and personal with replica Daleks from Doctor Who as well as other science-fiction props and costumes. Children can ask Daleks questions and occasionally the odd star of Doctor Who or Star Wars makes an appearance to meet fans and sign autographs. For more information about upcoming Charity Sci-Fi events, visit their website.